Instilled with the brilliance of contrasting transitioning of colours, Anahi Ametrine is considered to be one of the most glamorous gemstones! Find unique jewellery items studded with the fancy stone exclusively at TJC! Originating from a single source, this stone is considered to be very rare. It only makes it more luring that it holds not one but dual shades of colours, displaying an aweing transition. The stone is a variety of quartz that offers you the hues of amethyst and citrine in one, which is also a reason why it is ranking high in demand. However, Bolivia being the only source of it makes the supply run a little thinner than the demand. The name ametrine consists of the two names of quartz gemstones that it borrows its colours from, namely “amethyst” and “citrine.” There is only one place in the entire world where the gem is mined from and that is the Anahi mine in Bolivia, which is not far from Brazil. Now, the rocks from this mine may be citrine, amethyst, or a culmination of both (which is called ametrine, owing to its dual shades.) The ranges of ametrine can display deep, enriched hues of dark purple and yellow to lighter shades. The biggest and the highest-quality mine of ametrine is in Bolivia and is called Anahi. Because of the single supply, the stone is regarded as rare and costly. The mine was, back in the days of early 17th century, gifted by the tribesmen to a Spanish crusader, as a gift for the marriage with the princess of the tribe. Later, the Spanish people started sending the stone back to Spain, from where it gained popularity. Owing to the various oxidation states of iron found inside of the crystal, the colour transitioning quality is one the biggest reasons why ametrine is considered to be so popular and rich. The best quality of these gems show medium to dark orange colour with vivid to strong purple. The most intense hues are found in the stones with a high carat weight. Also, the most impressive of these stones are stark transparent in clarity, and show almost no visible inclusions. 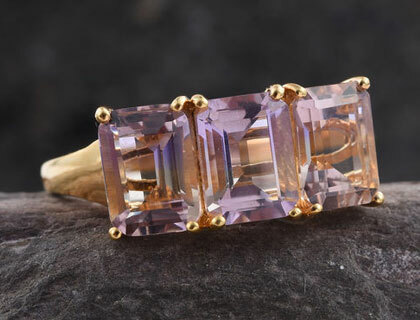 Ametrine rates 7 on the Mohs scale of hardness, which means that the stone is strong, durable, and long-lasting. These are the ideal traits for stones that connoisseurs love! If you’re looking for the best quality of these stones, displaying the most majestic colours, then all stones above the carat weight 5 are ideal for you. Like all the crystals that sparkle, ametrine can be used to deflect all the negativity from the wearer. It is a stone that is not only very important to the healers, but equally beneficial to the average people. It is believed the stone is blessed with helping you seek a spiritual awakening and psychic enlightenment. It also helps you maintain a positive mental energy and students finding companionship with it stay focused. Other uses of the stone, for the professional healers, are that it helps in fighting addiction, stress, depression, anxiety, and other ailments. It is also known to help beautifully for people who are struggling to lose weight. It is recommended that you take up regular meditation if you’re wearing the stone as it is powerful in its effects. Even though it ranks high on the Mohs scale of hardness, it does not make it immune to scratches and external abrasions. So, you need to take care of your jewellery. If you want to clean the stone, you may feel free to use warm water. For an additional sense of thoroughness, you can add a few drops of dish-soap to it. Do not try steam-cleaning for the stone as exposure to high temperatures may damage it. Ultrasonic cleaning methods can also be opted, even though they are rare. Ametrine is a type of quartz, getting its colours’ amalgamation from two different kinds of quartz, namely amethyst and citrine. The best and the most intense colours are spotted in the stones that weight more than 5 carat in weight. With deep purple to intense yellow, the highest quality stones are rare and expensive. The biggest global supplier to this gem is a mine named “Anahi” in Bolivia. The same mine supplies amethysts and citrine, and sometimes a rock is located with both the colours, which are then chiselled into fancy shapes and called ametrines. The stone has the healing benefits of both amethyst as well as citrine, which makes it a highly reverent stone for all the healers. It has high energy and helps in fighting a lot of emotional and mental ailments, like depression, anxiety, stress, et cetera. It ranks 7 on the Mohs scale of harness, which is only a level lower than diamond, but it does not mean that it is immune to scratches and external harm.